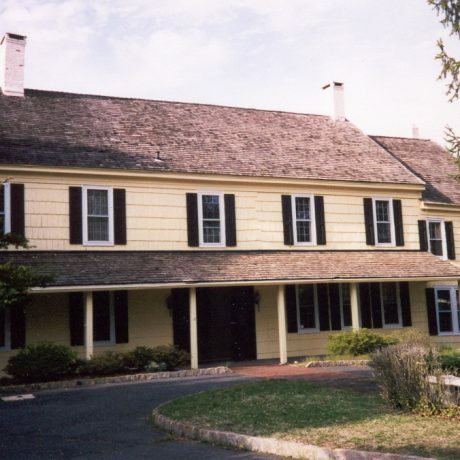 The Covenhoven Farmhouse in Colts Neck was constructed in several stages from the mid 18th century — when a member of the Covenhoven family built a one-and-a-half-story cottage on the site –to the mid 19th. The original home was typical of those found on Dutch farms in the area. By 1798, the Covenhoven name had become Conover and the house had been expanded to two stories. After additions in 1802 and 1863, the house became the large, five-bay symmetrical structure of today. The property remained in the Conover family until 1936. This site is significant for several reasons. Not only is the house one of the oldest residences in Colts Neck — one of a small group of original settlers’ homes that survive — but the property also boasts a wagon house built on a three-bay 11-bent Dutch frame, which still contains the original hardware and hoist in mow. The Covenhoven Farm, now privately owned by a corporation, has been vacant for several years. Both the home and wagon house are deteriorating from neglect and are potential targets for vandals. A local friends group has expressed interest in acquiring the property, restoring it as a house museum, and displaying an extensive collection of Conover family memorabilia.